It’s that time of year again! 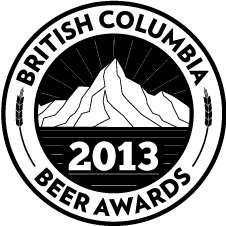 It is time to celebrate the best of the best breweries and beer in British Columbia. 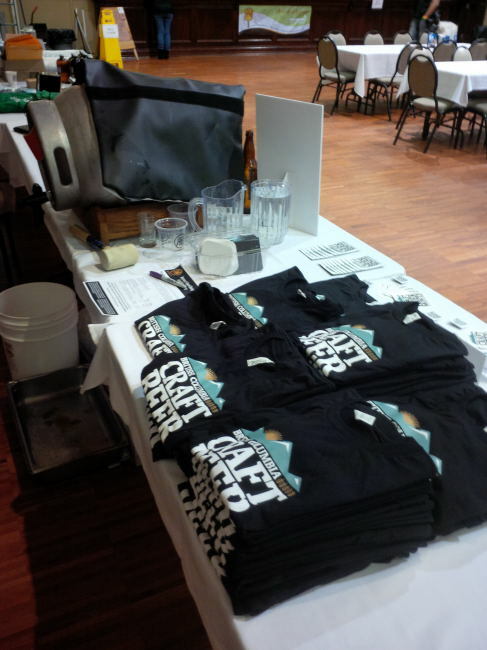 On October 25th, 2014 the BC Beer Awards were held at the Croatian Cultural Centre. 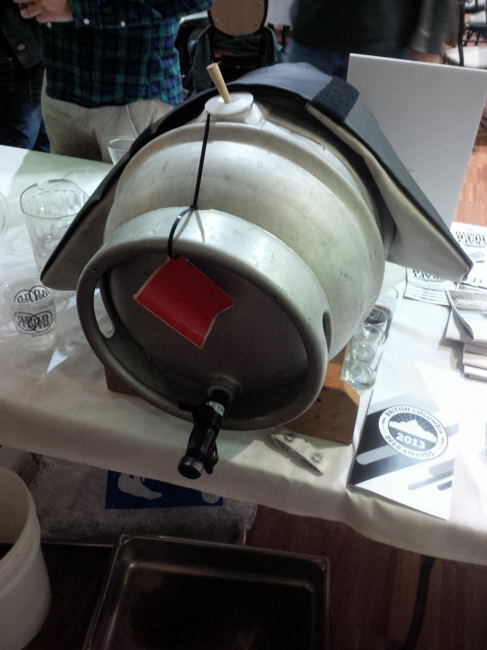 Like every year the beer awards are held with a caskbeer festival that runs at the same time. The event started at 4pm and went until 9pm. The beer festival starts right when the doors open and features some amazing beers from both the local Metro Vancouver and Victoria breweries as well as many breweries from around the Province. The breweries that poured beer at the event are as follows: Bomber Brewing, Bowen Island Brewing, Bridge Brewing Co, Cannery Brewing Company, Central City Brewers & Distillers, Coal Harbour Brewing Company, Dead Frog Brewery, Driftwood Brewery, Vancouver Island Brewing, Four Winds Brewing, Fuggles & Warlock Craftworks, Granville Island Brewing, Howe Sound Brewing Co., Hoyne Brewing Co., Lighthouse Brewing Co, Longwood Brewing, Main Street Brewing Company, Mission Springs Brewing Company, Moody Ales, Moon Under Water, Parallel 49 Brewing, Persephone Brewing Company, Phillips Brewing Company, Powell street craft brewery, Prohibition Brewing Company, R&B Brewing, Red Truck Beer Co, Russell Brewing, Scandal Brewing, Shaftbury Brewing Co., Steamworks Brewing Co., Steel & Oak Brewing Co., Three Ranges Brewing Company, Tofino Brewing, Townsite Brewing, Tree Brewing Company, Turning Point Brewery, Whistler Brewing Company, Yaletown Brewing co, Yellow Dog Brewing, Fernie Brewing, Brewhouse Whistler, Big Ridge, Vancouver Island Brewing. I am not sure what time the awards began but at a point they announced that everyone should approach the stage. Like last year Stephen Quinn of CBC Radio was the presenter for the awards. Last year around 300 beer were entered into 18 categories. 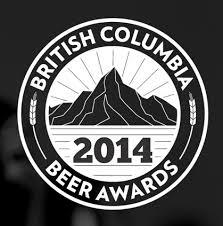 This year there was around 500 entries in the same 18 categories which really shows the growth of craft beer in BC. This year there was a lot more diversity to the winning breweries at the awards. Here are the winning beers in the categories as presented. Once all of the awards were announced the cask festival ramped back up. It was now time to see if you could sample some of the winning beers. Once again it was a very successful event with amazing people and amazing beer! I look forward to what might come next year as even more breweries are opening up and the industry is only getting better at making beer! I would like to congratulate all the winners this year! Every single one of you deserved the award for making a great tasty and enjoyable product! Here is to another year of sticking it to the flavourless garbage that macro breweries make. This year I helped with the setup of the beer awards between 11-4pm. It was great to be able to help in a small way to make this event go off so well. I thought I would share some of the photos from the setup. On October 19th, 2013 the BC Beer Awards 2013 / Cask Festival was held at the Croatian Cultural Centre in Vancouver BC. 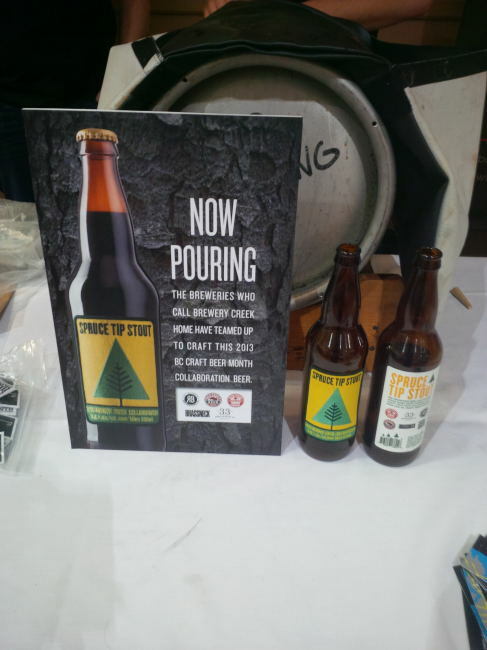 The event was a partnership of BC Craft Beer Month, BC Beer Awards and Camra BC. 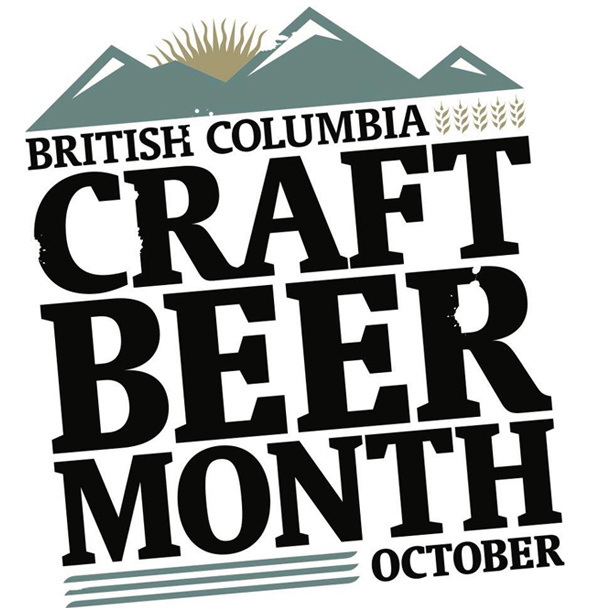 Like every year this event was hosted to celebrate all the amazing Craft Beer being produced in British Columbia. This was the fourth annual event and was a big step up on last years event (very polished). The Awards ran from 1 to 6 PM. I would like to thank the following people and groups. I was not going to be able to go to the event this year but Lundy made it happen! It was really fun to stand of the other side of the booth this year and see what it is like to be a volunteer. Being on the other side of the booth I was able to connect with so many people and find out what they loved about the beer at the event. I was also able to get recommendations on what beer to try when I was able to check out some samples. At the Booth we sold Beautiful Brewers of BC Calendars as well as BC Craft Beer Month Shirts. 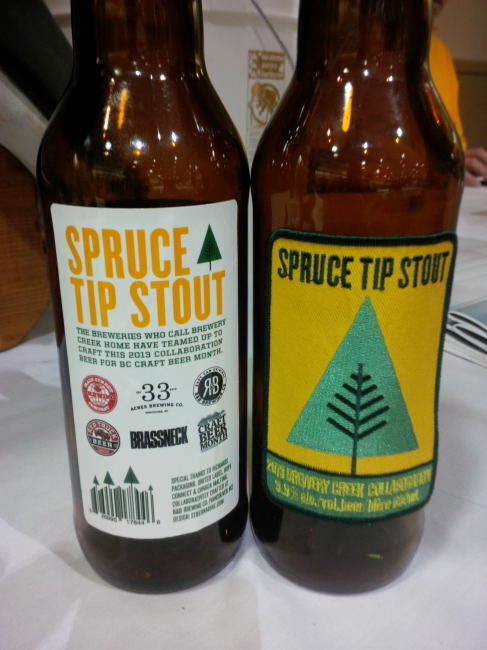 We also Poured the BC Craft Beer Month Collaboration Beer the “Spruce Tip Stout” a Brewery Creek District collaboration brewed by Main Street, 33 Acres, R&B, Red Truck and Brassneck Brewing. I was able to get a break from the booth before the awards to sample some beer and visit with all my great beer friends. I tried samples from a few breweries including Central City, Bridge, Driftwood, Granville Island, Howe Sound, Persephone, Parallel 49, Tree Brewing, Yaletown. I don’t think I could pick a favorite beer at the event but I can say I was super excited to sample Persephone Brewing Companies beer and was even more excited about it after tasting it! The full list of breweries pouring at the event from what I understand are as follows: 33 Acres Brewing Company, Big Ridge, Big River, Big Surf, Bridge, Coal Harbour, Central City (Red Racer), Coal Harbour, Dead Frog, Deep Cove, Driftwood, Fernie, Four Winds, Granville Island Brewhouse Whistler, Howe Sound, Hoyne, Lighthouse, Longwood, Moon Under Water, Nelson Brewing Co, Old Yale,Persephone, Parallel 49, Powell Street, R&B, Red Truck, Steam Works, Tinwhistle, Townsite, Tree Brewing, Vancouver Island, Whistler and Yaletown Brewing. Around 3pm the awards started at the main stage. The presenter was Stephen Quinn of CBC radio. He was a great host and added so great bits of info on beer styles for the less knowledgeable and made a few good jokes. Well lets waste no more time and let you know who won all the awards this year! Because I took a ton of time taking photos during the awards I headed back to the the BC Craft Beer month booth and relieved the other crew for the rest of the show. There were lots of people to serve and chat with and we ended up selling a bunch of Beautiful Brewers Of BC Calendars as well as a bunch of BC Craft Beer Month Shirts. I could tell from everyone at the event that they had a ton of fun and enjoyed all the beer being served. I look forward to next years event and look forward to which new breweries win next year! I can’t wait until the next time I can Volunteer at a beer event in the future! Hint Hint! Full Sized Photos can be viewed here!